Ok, first up who is Carrie? I'm a 20 year old dreamer/fashion promotion student living in London with a love for vintage and all things twee! How long have you been blogging, what made you want start it in the first place? I began when I was 17, so nearly 3 years ago now! I loved creating websites and read lots of blogs so it seemed natural to create one of my own. I decided I wanted to take more photos and document my life like other blogs..and it went from there. What inspires your blog posts? Collars, dresses, chunky shoes, pastel colours, bows, handbags, old books, pretty prints, berets and beehives! I just post about the things I love, whether it's something i've bought & worn, a lookbook, a wishlist, or even a feeling. How would you describe your style? I always hate answering this question as I feel my style is always changing. At the moment it's all very 60s inspired, with mini shift dresses and big shoes. I tend to play it safe but that's because I know what I like and what suits me. 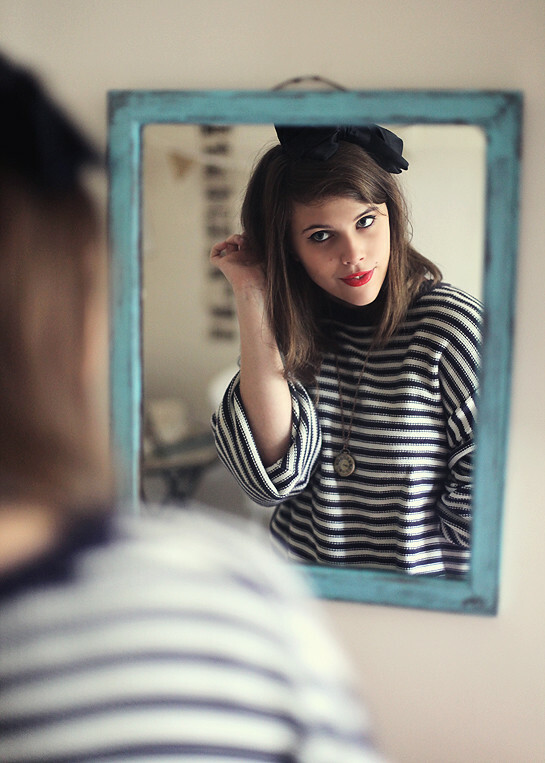 Breton stripes, satchels, brogues and bowler hats! What three items can you not live without? I'm going to be terribly materialistic and say my Mulberry Alexa, my laptop and my camera! What do you get up to when you're not blogging? If it was up to me, i'd be hanging out with my besties exploring National Trust houses and eating lots of cake! In reality, I spend a lot of time replying to emails and getting on with my university work..boo! Tell us something no one else knows about you... I'm a huge monkey and ape lover! I visit the rescue centre Monkey World every year for my birthday and practially know all of their names! thing about this season? Wearing coats! I'm a coat fiend, I have far too many but can't help but buy new ones. I have quite a growing collection! Ah great interview! And its such a fab blog too! her blog is very good, it seems she and her partner have a shared vision for it and both have the talent to back it up! Nice interview too. Really enjoyed this interview! Great to learn more about Carrie. Thanks for doing this wonderful interview.